Awesome work, thanks. 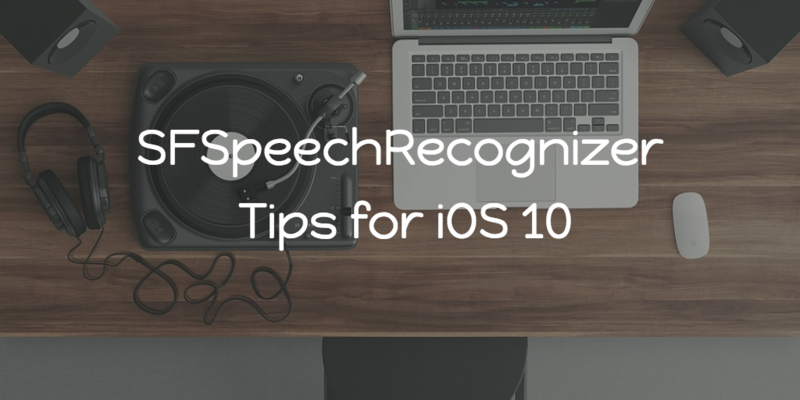 A few observation: SFSpeechRecognizer calls home as requires network connection. If you abuse it too long, like I did when made it listen to the radio, it will ban the application for a little while and return “Quota limit reached for resource: speech_api, Error Domain=SiriSpeechErrorDomain”. So be gentle to Siri. No problem, I’m glad you enjoyed it! Thanks for chiming in! nice work and nice tips to overcome the already known problems. I experienced another problem with this API. I tried to use the speech recognition together with some system sounds (search the database for matching text, and if found stop the recording and play a sound). As soon as I start the speech recognition, no sound Output is possible anymore. If someone has an idea how to overcome this issue, please let me know. Thanks a lot for the tutorial. I’m trying to use in my App and I have an issue that availabilityDidChange delegate is never called. I have SFSpeechRecognizer.delegate set in viewDidLoad. Have you got this problem too? Thanks for the post. I was wondering if anyone has had any luck accessing the ‘timestamp’ property of a transcription segment. This newly available timing information is what I believe to be the coolest thing about the API and it doesn’t seem to work properly! For some reason we are getting a message that says “Quota Limit reached for resource”. Have you guys figured out, under what scenarios this error message is received? Our utterance duration is definitely less than 1 minute. Is there a limit to the number of times this speech engine can be invoked from the device/app on a daily basis? Would be useful to know all the limitations.